2-3 dl of red wine. spices - preferably fresh - use plenty. Cut 5 of the garlic cloves into "wedges"
Punch holes in the leg of lamb with a small sharp knife, and insert the garlic wedges into them. Moisten the leg with some oil or water so that the spices can stick to it. Cover the leg with plenty of salt and pepper. 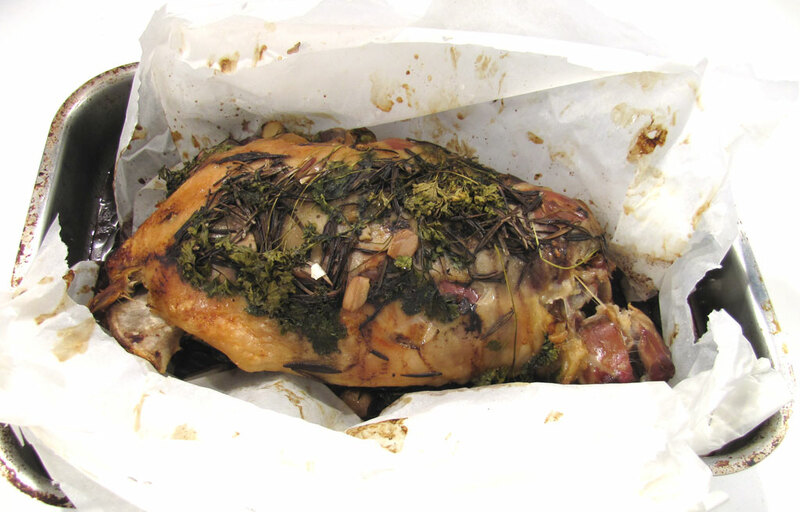 If you do not have a large enough closed pot, clay pot, or similar that can hold the leg of lamb, then cut two pieces of baking paper that can go all the way around the leg, respectively, the short and long side of the leg. If you have a closed pan that is big enough, then just use that instead of paper. Put the two pieces of paper in the bottom of a deep baking pan. Put in half of the remaining garlic. Put in half of the herbs in. Pour in the red wine. Put in the leg of lamb. Put the rest of the garlic and herbs on top of the lamb. 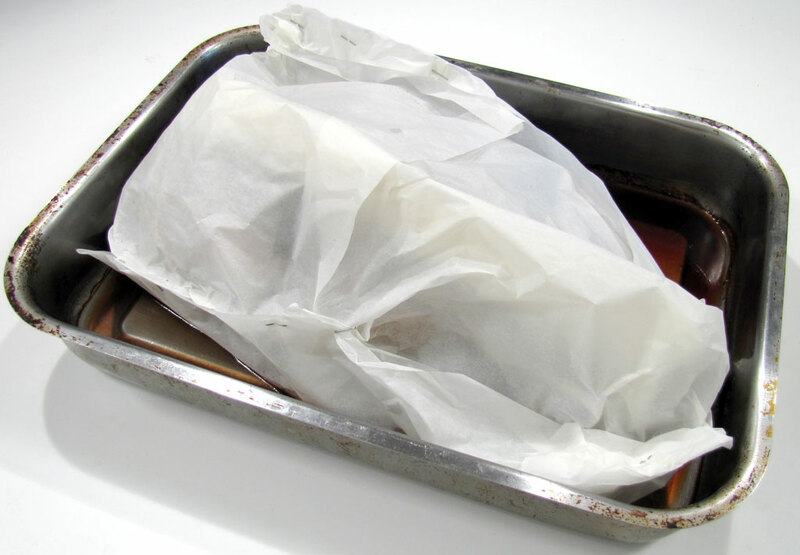 Fold the baking paper over the leg to get as closed a package as possible. I usually use a stapler to close it with. But if you use a lot of wax paper, it is not necessary. Bake for 4-5 hours at 130°C (265°F), or 10-12 hours at 100°C (210°F). The internal temperature should be at least 75°C (167°F). If the leg reaches 75°C (167°F) it will be tender but firm. There are many who like this the best. You will need to cut of the bone with a knife. 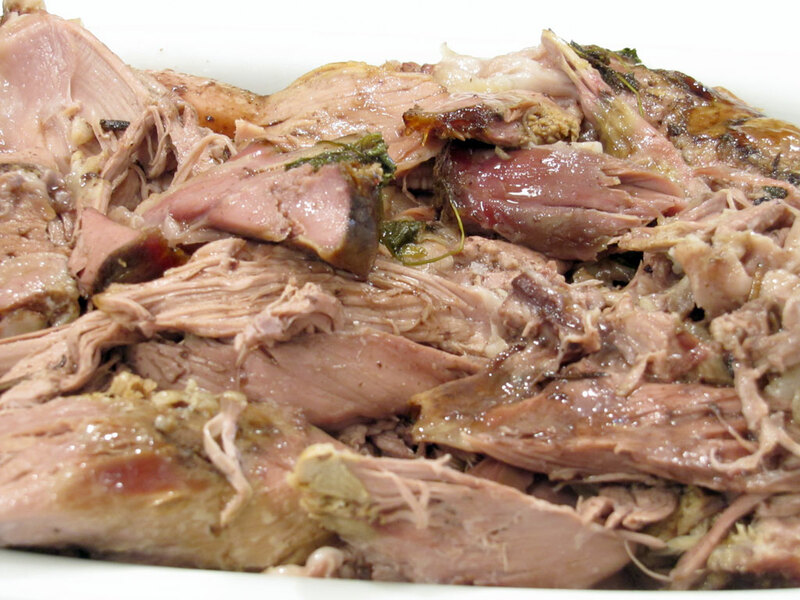 The lamb I've photographed for this recipe was given 12 hours at 100°C (210°F) no convection. It reached an internal temperature of 84°C (183°F). And it was absolutely super tender. The way I prefer to have it. 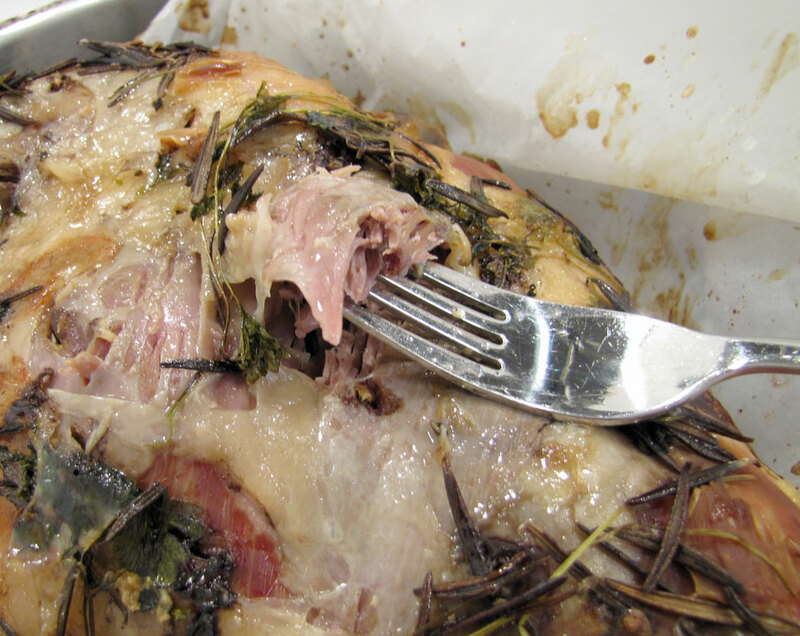 It was a very large leg of lamb of about 3 ½ kg (7 lbs). Smaller legs should probably not have more than 10 hours. It was placed in the oven at night and was left overnight. When it was finished, it was separated from the bone with a fork and put into a bowl with the juices from the bottom of the pan. Then it was ready to be warmed up in the evening when it was to be eaten.